This figure is particularly colourful and has a dramatic active pose. 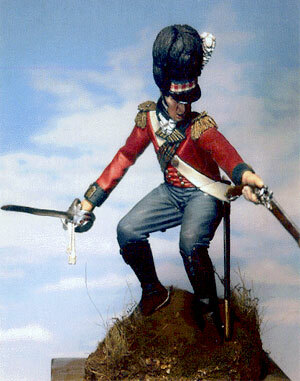 For Napoleonic modellers following the battles in Spain of this era, this figure is a must. Ultimately, this series of battles ended in British and Portuguese forces being driven back behind the lines of Torres Vedras in Portugal. From that point, Napoleon was eventually driven out of Spain and finally imprisoned in Elba. The colours of many British regiments reflect these conflicts.